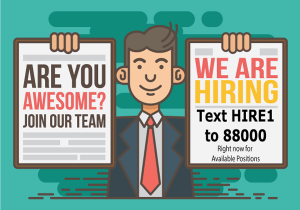 Every person who walks or drives by one of your Now Hiring signs is a potential candidate or referral source. While he or she may not be looking for a job at Al’s Tacos today, her cousin/brother/friend/co-worker etc… may be looking. The DriveBuy Tech Text Message Recruiting platform provides a simple method to deliver information instantly, via text message, about available positions, locations and next steps in the hiring process. No apps to download. Every potential candidate with a cell phone already has the text messaging app installed! Don’t miss out on another potential candidate opportunity. 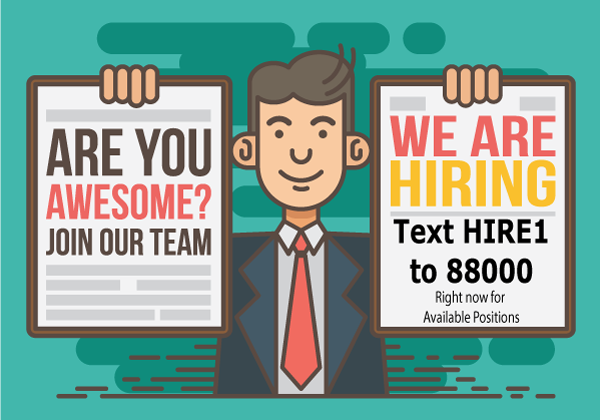 Make all your Now Hiring signs actionable with text message calls to action. Try out the demo below and let us know what you think. Text message recruiting by location allows you to continuously source candidates whether you have open positions or not. This gives you a built-in candidate pool to hire from when ready. Spend more of your valuable time with qualified Applicants. Increasing the flow of candidates at the beginning of the funnel results in more quality hires and employee retention. Be more responsive to candidates and gain a competitive advantage by giving a candidate the information they want about available positions instantly.